January 27, 2017, 10:54 a.m.
Over the past month or so many economists have started to walk back from some of the gloomier forecasts of what they thought would happen in the wake of a Brexit vote. Consumers have noticed and are now assessing their economic situations with their own eyes. On the whole they are becoming marginally more bullish, as reflected in this month’s YouGov/Cebr Consumer Confidence Index which has risen by +2.0 points to 110.3 – representing its biggest monthly increase since August and its highest level since September. 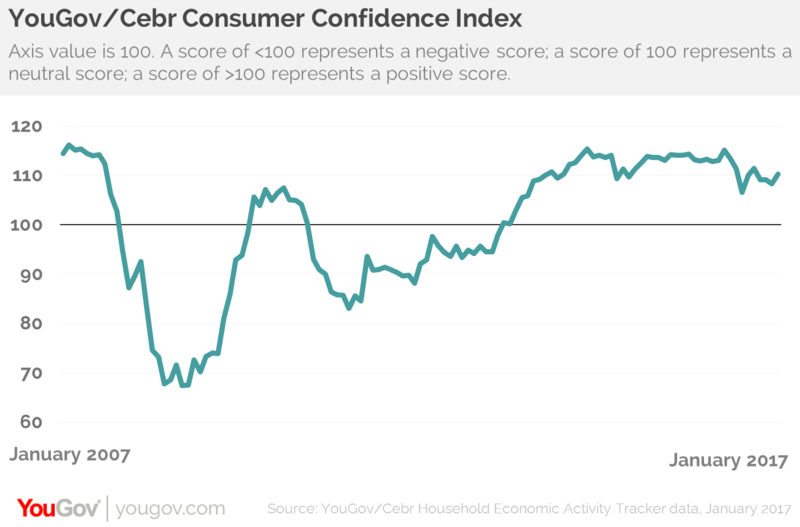 While the improvement in confidence is good news for the economy and reflects a certain resilience, and although any score over 100 shows more consumers are confident than unconfident, the index remains notably below the level it was at before the UK voted to leave the European Union. We collect consumer confidence data each day, conducting 6,000 interviews a month. Respondents are asked about household finances, property prices, job security and business activity, both over the past 30 days and looking ahead to the next 12 months. Seven of these eight measures have improved over the last 30 days. The largest increases have come in expected house values over the next year, business activity in the workplace over the past month and expected business activity in the workplace over the coming year. Both the backward and forward-looking household finance measures – which have been slowly declining over recent months – have both improved slightly in January. Only recent job security has fallen. When it comes to the consumer impact of Brexit we are still very much in the early stages. Furthermore, there may be a sting in the tail. Inflation is picking up and the rising cost of living could start to erode consumer confidence, particularly if pay growth stays subdued. However, at the moment, things look good.